However, the Bealach na Ba hides a secret: the sublime coastal roads that lie beyond its fearsome slopes. Leading away from Applecross Bay, they offer an undulating odyssey of eye candy, their stretching sea views interspersed with sandy bays and stark moorland. Rich reward for the cyclist who conquers the Bealach! … the infamous Bealach na Ba… Crossing the forbidding hills behind Kishorn and rising to 2,053ft, with a gradient and switchback bends worthy of the Alps, this route – a popular cycling piste – is hair-raising in places, but the panoramic views across the Minch to Raasay and Skye more than compensate…. After crossing the low-lying farm land at the head of Loch Kishorn, the Applecross road turns sharp left over the river Kishorn, and begins the gentle introductory assault on one of the most spectacular mountain roads in Britain, which rises to 2,053 feet only six miles or so after leaving the shore of the sea loch. 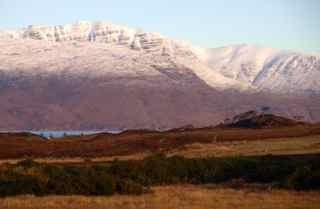 Straight ahead from the approach to the river is the south west side of Beinn Bhan, steep-rising slopes of bare rock, boulders and heather that sum up the appearance of the giant Applecross peninsula. Beyond… the road climbs to the right over the shoulder of the hill… and suddenly comes to a most impressive view of the towering summits that guard the entrance to the stiffest part of the Pass of the Cattle… The road hugs a ledge on the north side, and the gradient becomes much stiffer… the road is single-track although there are enough passing places… if there are ten cars every thirty minutes during the holiday season, the traffic is said to be very heavy. …The series of hairpins by which the road reaches the steep sided saddle that leads to the invisible summit of the pass, can be seen for a mile or two along the approach. 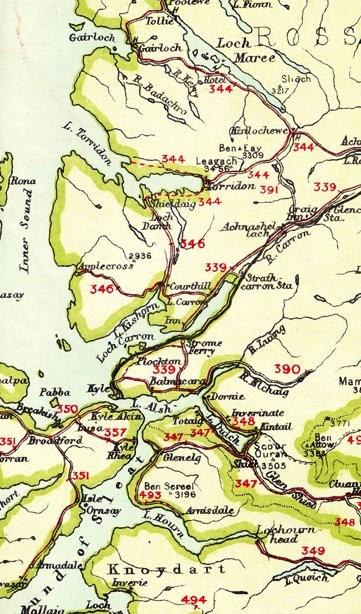 The top of the road is marked on some maps as the Bealch nam Bo, and on others as the Bealach na Ba; both mean the Pass of the Cattle, and the second is said to be the more accurate Gaelic… the pronunciation is roughly byaallach, with accent on the drawled first syllable and the l sounded further forward than in English. …In fact, the final assault on the highest part of the pass, with the road twisting and turning through the series of hairpins, is one of the most exhilarating moments… the view backwards is most impressive. Near the top of the pass are some stone cairns… built haphazardly by modern travellers and have no special significance… The outlook from this high viewpoint is mostly of bare rock and boulders… Out to sea there’s a splendid view over Raasay and the mountains of Skye, and the smaller islands of the Inner Sound. 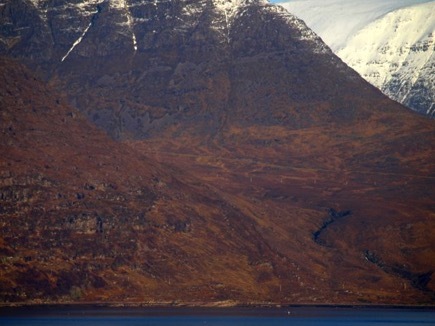 The sense of isolation in Applecross is in large part an effect of the Bealach na Ba. But much more than that is implied in the old names for the peninsula, which was Comeraich, a Sanctuary – the only name known in the language of the people themselves. It was first made a sanctuary by the arrival here in 673 of St. Maelrubha, and continued under the church as a recognised sanctuary for all manner of fugitives in succeeding centuries till the Reformation. The bounds of the sanctuary lands, centred on the river’s estuary, were marked by a six mile arc of stones. All these have gone. The most southerly stone was a cross eight feet high, which used to stand on a promontory at Camusterach. This was deliberately smashed by a mason repairing the Free Church. 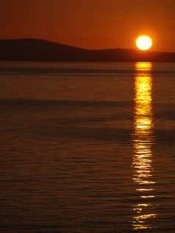 The name Applecross is from Apor-crossan, first mentioned in Tighernac’s Latin Annals. His Crossan is the Applecross river, which is still locally known as the Crossan. Apor is from the Gaelic Aber meaning Estuary. Tales have gained currency, principally through an error of the Third Statistical Account of 1845, that the name Applecross arose on the break-up of the clan territory, when the new proprietor of the estate re-named Applecross after planting five apple-trees crosswise in his garden. When examined in 1854, all but one of these trees were found to be chestnuts. The modern name Applecross first appears in papal documents of 1275 – clearly a written corruption of the an ill-heard “Abercrossan’. …Two miles beyond Courthill, the Applecross road diverges to the left, crosses the Kishorn River at Tornapress Bridge, and begins its long climb to the Bealach nam Bo (Cattle Pass), curving round the lower slopes of Beinn Bhan. …continuing in a north-westerly direction the road begins to fall, curls round the flanks of Meall gorm down a steep and twisting hill, and opens up an extensive view to the north and west. 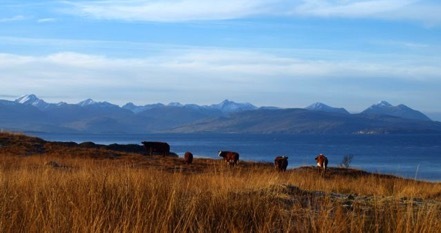 The brown moors of Applecross roll northwards to Loch Torridon, with Longa and the low lands of Gairloch beyond in the blue distance: Rassay, Rona and Skye lie west across the sea. A long rough descent to the bridge over the Allt Beag is followed by a short rise, then with a west ward sweep of 3 miles the road swings down to Applecross village, on the south side of Applecross Bay. 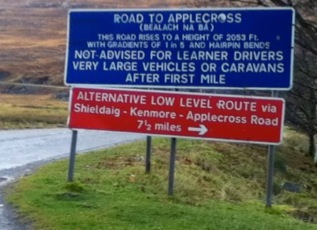 It is with regret we have to pass by the roadway leading to Applecross… and climb that famous hill through the Pass of the Cattle to its summit on a roadway two thousand feet above the sea. 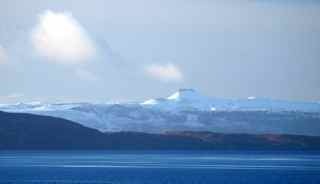 Here we would have seen the magnificence of the Sound of Raasay, the hills of northern Skye, with the dark Quirang, their overlord, and on a clear day the Outer Isles. The village of Applecross is interesting for its legends and traditions. The district of Applecross from its gaelic name means “the Place of Safety”… possibly derived from its old time ecclesiastical establishment in which the hunted and criminal found sanctuary… The interest in the name of Applecross itself occasions my asking one who knows this district well if he could offer a suggestion as to its origin. His explanation was that the proprietor of the district was said to have planted five apple trees in the form of a cross to commemorate an event of sacred character… another traditionary (sic) origin of the name is attributable to Saint Meal Rubha who founded a monastery there about 673 AD and that every apple growing in the orchard of this monastery bore on its skin the mark of a cross giving the place the name of Applecross. …and opposite us as we approach Courthill, are the precipitous mountains of Applecross, across which the road to the Milton of Applecross (inn) proceeds west from the head of Loch Kishorn by the wild high pass called Bealach-nam-Bo (the pass of the cattle). 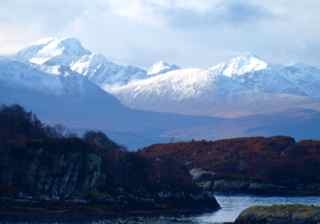 …The road attains its summit-level of 2054 ft. by a series of corkscrew traverses, and displays along its course the wildest description of scenery… It commands a magnificent view from the top, comprehending (sic) the island of Skye and the whole chain of the Hebrides. The green and wooded plain of Applecross, to which it ultimately conducts, is a valley encompassed by high mountains, which completely isolate it from the rest of the world. …the modern name of Applecross refers to a monkish tradition, that every apple that grew in the old orchard bore the mark of the cross. ... Loch Shieldaig may be approached by a path which goes up the pretty glen of Aplecross Water, and hence almost due north over the rough hills to Inverban – about 8miles from Milton and 4 west of Shieldaig Inn. MAP of Dingwall and Skye Railway in Blacks guide to Scotland.